Data Privacy Day is a reminder to protect your personal information, and your web browsing history. BALTIMORE — With all the data breaches we saw in 2018, it may seem like an impossible task to protect your online information, but a data privacy company says there are ways to minimize your exposure. 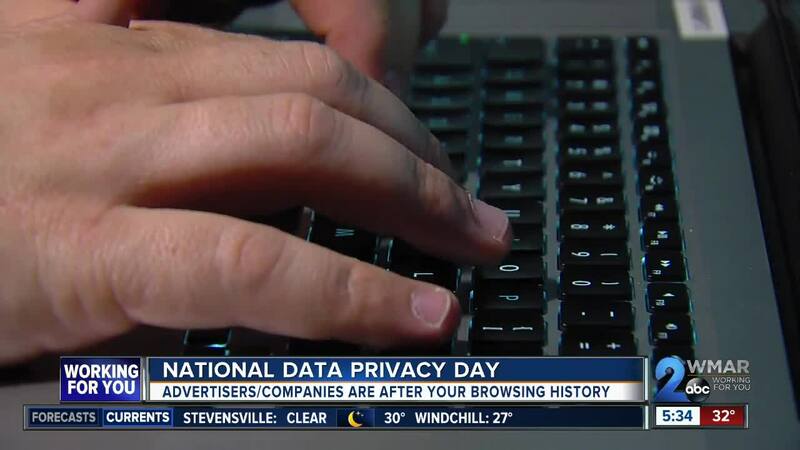 Baltimore-based privacy protection company TrackOFF found that 75 percent of the websites you visit collect information about you, such as your web browsing history. Seeing what clothes or items you shop for online may seem harmless, but there are much bigger concerns. Insurance companies and creditors could potentially buy this information from data brokers and use it against you. “Based on what you look at on the web, a bank might buy information from a data broker that shows them you're an irresponsible shopper and that might impact your ability to obtain credit,” said Chandler Givens, CEO of TrackOFF. TrackOFF is one service aimed at privacy protection. They mask your device so data brokers aren't able to see that it's you searching for this information. Their service costs around $30 a year.